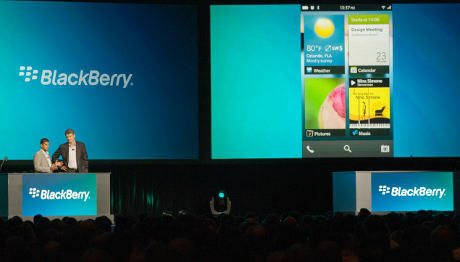 Orlando, USA - Research In Motion (RIM) BlackBerry OS reveals low 10 in the event the BlackBerry World 2012. At this same event, the BlackBerry 10 Dev Alpha, touchscreen RIM smartphone prototype is introduced. Although still being developed, a number of features already heralded this will be the flagship smartphone. BlackBerry 10 Dev Alpha seems to be prepared to match the iPhone, Android and Windows Phone that puts the touch screen. RIM CEO accompany onstage BlackBerry World 2012, Head of Software Vivek Bhardwaj RIM's portfolio demonstrating the ease of interacting on-screen BlackBerry Dev Alpha 10 is a 4 inch. Yes, this full touch screen prototype. Not a touch screen in combination with a physical keyboard like the BlackBerry series ever. "Everything flows. In one screen, you can open several pages, find the notification and navigate smoothly," said Bhardwaj who appeared at the Orlando World Center Marriott, Florida, United States. New notification feature allows users to access the notifications simply by swiping finger (swipe) to the side of the screen. In the demo on stage, Thorsten Heins showed swipe movement can display three applications in one screen page is piled neatly. BlackBerry handsets are known with a Qwerty keyboard. But with features 10 touch-screen BlackBerry Dev Alpha as not to forget the 'nature' to pay attention to typing comfort. Bhardwaj is said, the keyboard on the touch screen using an algorithm adapted to facilitate the user to type of activity. There is word suggestion feature that will predict the word that is typed, so that typing becomes faster and the user does not have to type each word as a whole. When the user is typing, word suggestion will appear and the user just did swipe to add it to the message being typed. Word suggestion was not new and have never been there in a few touch screen phones. But in the popular BlackBerry handset using a physical keyboard, this will provide a new experience for its users. There is an interesting feature on the camera BlackBerry Dev Alpha 10. Namely its ability to capture a moment is missed so that the moment captured images look perfect. Thorsten Heins called continuous autofocus. BlackBerry with OS software 10, providing the ability to repeat as the moment and fix 'disability' in the photo. For example, as shown in the demo when a photograph of two men at first glance seems perfect. But after carefully observed, the images look less okay because one of the photos appear blinking. Well, the camera feature allows the user to scroll forward or backward a frame (forward-backward) to find a good moment.